Wow it has been a long while since I’ve had a proper cask ale. There is no better beer than a fresh beer and fresh it was on Tuesday night off Whyte Ave at The Next Act Pub in Edmonton. I was super excited to try this cask specifically because it was the new dragon series release from Alley Kat and I have been really enjoying them thus far. The cask was ‘Maroon Dragon’ which is a delightful DIPA on Centennial hops. It was a packed house and everyone was excited to try the cask. After a short intro from Alley Kat’s rep, which included a hilarious description of how many hops were added to the cask, manager Mike popped the tap in. There was a waiting list and while we waited my friend and I enjoyed a pint of Red Racer IPA. Halfway through our first pint our cask ales arrived. Look at this gloriously orange, glowing pint, how could it not be delicious. Now let me take a moment to explain what exactly cask ale is and what makes it so special. Cask ale, or real ale, is fresh beer that has been poured from its primary fermenter into its secondary to finish its fermenting in the container that it will also be dispensed from. Normal beer would, at this point, be force carbonated into cans, bottles or kegs. Cask ale does not have added carbonation only the naturally occurring carbon dioxide from the primary yeast finishing the left over sugar from the primary fermenter. Cask ale also isn’t as cold as typical beer as it needs to be a little warmer(12-15°C) to allow the last bit of fermentation to occur. Cask ale is a living, changing thing and the first pint that is pulled from a cask is slightly different than the final pint as oxygen is allowed to enter the cask and the flavour starts to change from that point onward. Unlike with a pressurized keg where the beer is protected from oxygen with a blanket of CO2 and the first pint tastes the same as the last. Also with cask ale the brewery can make smaller batches of beer and infuse it with different herbs, in this case more hops, and if the experiment goes wrong no harm is done to the rest of the beer. Cask ale has been a favorite lately among North American Craft Breweries and I support this trend as cask ale is as fresh as beer can get and fresh beer tastes the best, that’s the whole point. Some complain that cask ale is flat and warm and in comparison to the overly chilled and overly bubbly North American adjunct lagers it is. 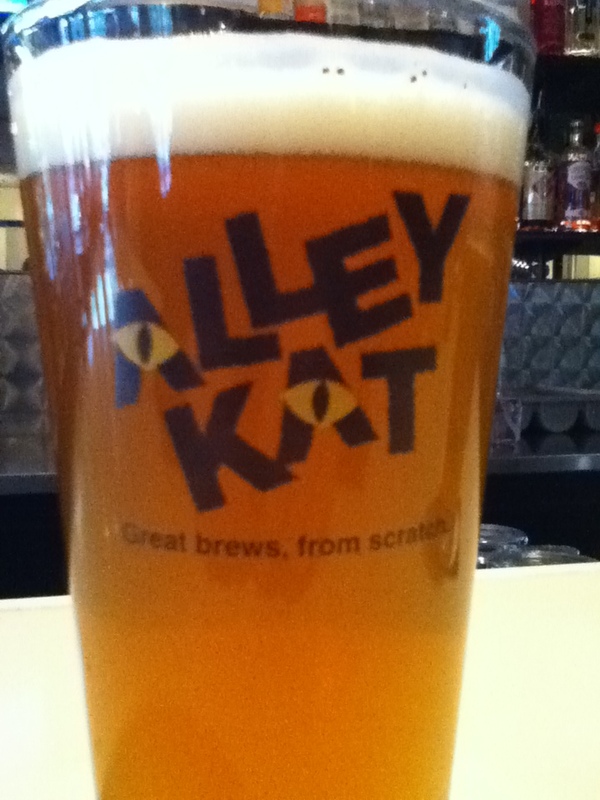 But I implore you, the beer drinker, to look past these differences and taste what real beer tastes like because it’s wonderful and in the case of this Alley Kat cask truly brilliant. This particular Maroon Dragon cask had very lovely malt base, a little sweet and a little crispy, just right. The brilliance with this particular cask was the subtle way the hops crept up on you. The first three sips or so were well balanced and almost more like a pale ale hop wise but eventually a very delightful bitterness began to grow on the sides of my tongue. The centennial hops used in this brew really began to shine, piney with a little citrus and very bright, no earthyness or floral aroma from this one, magnificent. My hat is off to you Alley Kat and many thanks for doing cask ale events here’s to many more. I am also really looking forward to tasting the difference when I finally get my hand on a bottle of Maroon Dragon which I believe should be out this week. Cheers from the WCBL!